Hewlett-Packard's decision to split into two companies is just the latest in a series of corporate breakups. Ironically enough, the last company that HP (HPQ) CEO Meg Whitman led, eBay (EBAY), disclosed plans last week to spin off PayPal -- which was bought under Whitman's watch in 2002. Considering that HP's stock was up more than 4% Monday on the news and eBay surged 7.5% the day it announced its split, expect more spinoffs. Big companies live and die by the "me too" copycat strategy. 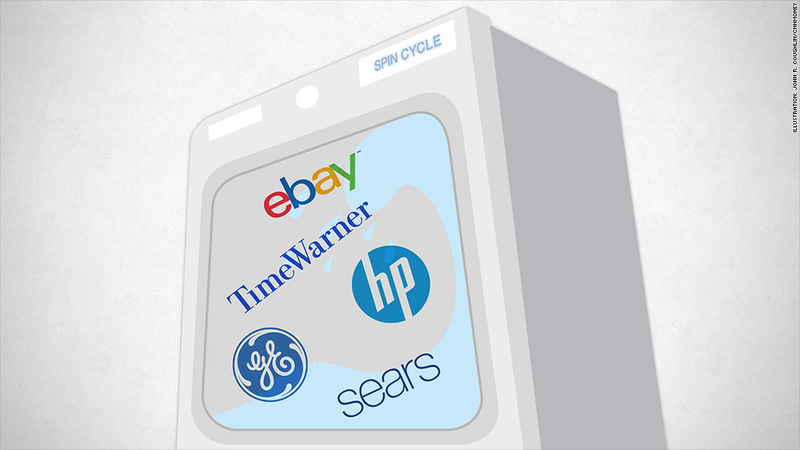 If the stock market were a washing machine, we're definitely in the middle of a "spin cycle" right now. Joe Cornell, publisher of Spin-Off Research, a firm that tracks corporate splits, said that this is shaping up to be the biggest year for spin-offs since 2000. And it's not just technology companies that are selling off pieces of themselves either. The biggest spin-off this year was GE's (GE) initial public offering for its credit card unit Synchrony Financial (SYF). CNNMoney owner Time Warner (TWX) spun off its publishing unit Time Inc. (TIME) a few months ago. And another media company, USA Today publisher Gannett (GCI), plans to separate its newspapers from its TV station business. Several well-known consumer companies have announced breakups or are in the process of doing so. Struggling retailer Sears (SHLD) spun off Lands' End (LE) -- and Lands' End has thrived since being set free from Sears. Kleenex maker Kimberly-Clark (KMB), Hertz (HTZ), Barnes & Noble (BKS) and Energizer (ENR) are also planning to spin off units. So who could be next to split? Cornell thinks energy companies Apache (APA) and Babcock & Wilcox (BWC) could be candidates for a breakup. Babcock & Wilcox has already said it is considering a split and both it and Apache are facing pressure from activist hedge funds to boost returns. Cornell added that more telecoms could follow the lead of Windstream (WIN) and spin off landline units into real estate investment trusts to take advantage of favorable tax treatments for REITs. He suggested that smaller regional telecoms CenturyLink (CTL) and Frontier (FTR) could do a REIT conversion and that even Verizon (VZ) might want to consider it. Whether or not breakups work for any of these individual companies remains to be seen. But it does appear that the companies that are spun off are good bets. 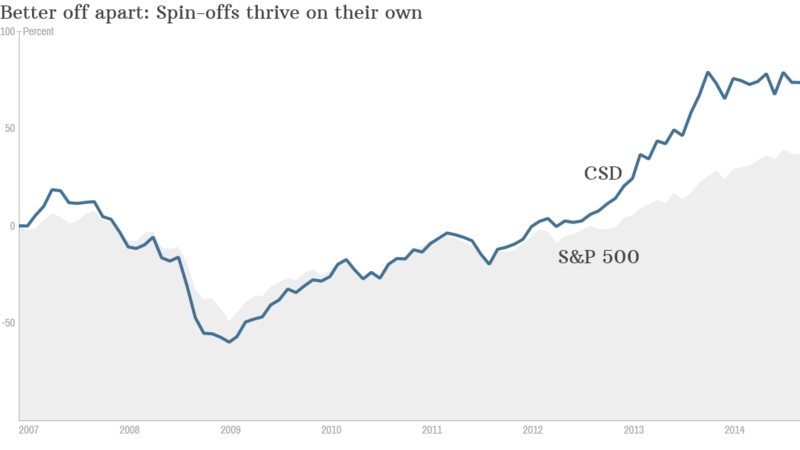 The Guggenheim Spin-off ETF (CSD), which tracks an index of spin-offs, has outperformed the S&P 500 since it began trading in 2006. Two of the top holdings in the fund are Zoetis (ZTS), the veterinary medicine unit that used to be owned by drug giant Pfizer (PFE), and soy milk producer WhiteWave (WWAV), a spin-off of Dean Foods (DF). "Investors prefer more focused, nimble companies," Cornell said.